‘Developmentalism’ is now a morbid zeal, mobilized to survey, to GIS, to digitize, to research, and colonize ‘Third World Cities.’ And in this zeal, lies the panoptic desire to turn the steel frame of the Nation State into The Grid and the Rule of Law, the Master Plan that poses the activist academic as an emancipator, speaking on behalf of the voiceless poor. And with this, a formalization of the Grid into a distinct street away from the city. 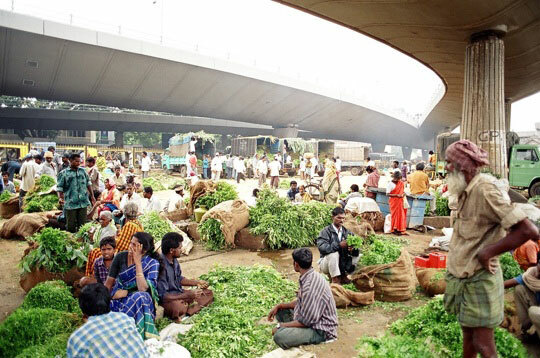 This question is asked by many – in these times of ‘illegal’ migrants, of street vendors seen to disrupt traffic flows and “legitimate” pedestrians, and the zeal for “policy advice, participatory planning and public consultations” and attempts to soften the hard edge of Master Plans – but not addressing the issue of property. These are also times the endorsement of the high art as a property circuit now seeks the ‘street as ritual’ disciplined into safe ‘heritage zones’². Are these pointers of an implicit ‘fear of the street’ depoliticizing our conception of urban space? Does asking this question, and drawing from Bromley³, reinforce the discipline and violence of the Grid and the Rule of Law? Or, is there a need to reject the bifurcation between the Street and City, and with it, a view that the city is necessarily ‘striated’4 whose singular forms property in land and commodity long been naturalized? Perhaps we should locate such questions and their associated interventions as a result of the fear of the undisciplined city, the complexity and fluidity of which subverts easy political and economic control. This is not very different from those promoted in Mumbai’s central downtown areas, and spurring a similar mobilization of ‘culture’ in other cities such as Bangalore and Delhi. The local – not inaccurate – term for this is ‘culture vulture’. But the event can be compared with the more anarchic Chinatown business and retail hosted China Town festival. 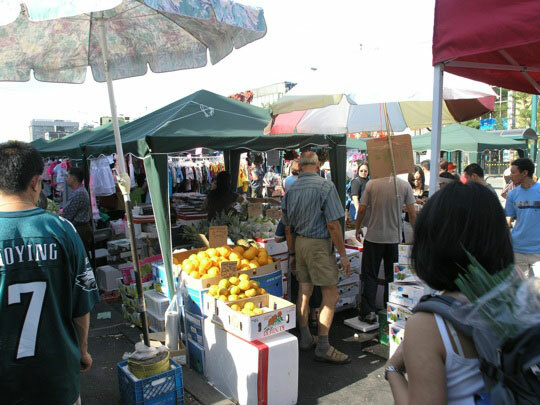 For the last nine years, the main street opposite Chinatown has been appropriated in the mild August air with food stalls and at least two bandstands at each end of the strip. This event, apart from the expected Chinese theatre, also includes Brazilian drumming and Bollywood dances. 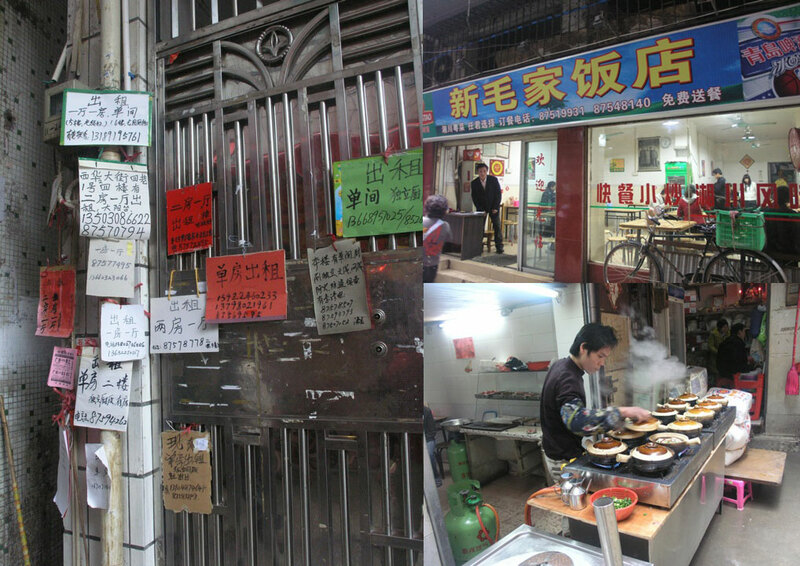 In between these two cultural outposts are eateries, and the retail sale of non-branded look-alike commodities flourishes. These are alternated with the stands of politicians – announcing their plans for this rapidly emerging and vigilant constituency9. “… For years, Kensington worked because it didn’t quite work. The market’s eclectic chaos evolved organically, thanks to generations of immigrant merchants operating in tiny shops on narrow lots, many with residences opening onto rear service laneways. The streets aren’t easily navigated, and fractured land-ownership patterns allowed Kensington to remain essentially unchanged for decades. 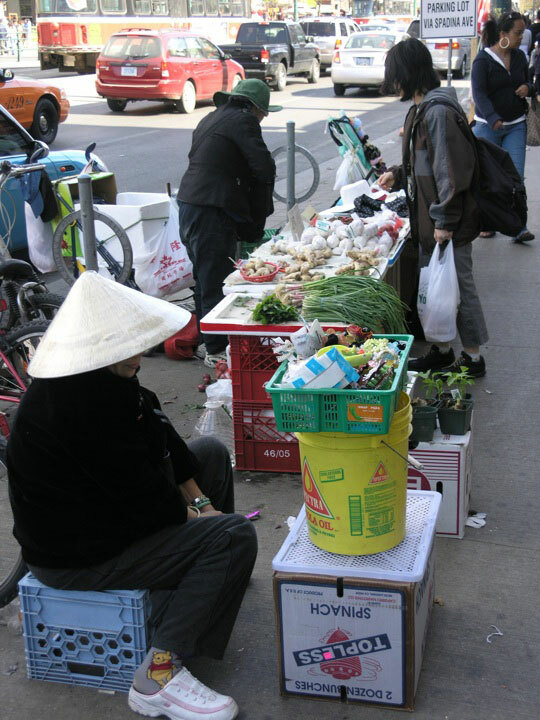 “The market,” area councillor Adam Vaughan says, “has naturally built-in deficiencies that allow it to survive…”11. Councillor Vaughan’s pointer to the role of ‘fractured’ land ownership in constraining gentrification touches on a central issue from the perspective of the complexity of tenure that restricts corporate capital but also opens up space for competing economies around ‘mom & pop’ stores. This situation is characterized by a political consciousness that remains deeply suspicious of the efforts of City Hall to mobilize a language of ‘people friendly’ planning via ‘pedestrian Sundays’, viewing these efforts as a strategy to split local alliances12. My interviews within the local artistic and activist community suggest that such popular political consciousness well recognizes attempts at ‘participatory planning’ as rhetoric to hide the politics of the wider institutional structure of the Ontario Municipal Board and TEDCO in their efforts to gentrify Toronto’s downtown. Also central here is the 1998 amalgamation of the surrounding towns into the greater Toronto area – a shift which saw increased power for the Mayor, at the cost of the elected council. ‘Gentrification’ is thus seen as a process, which is not just an effect of meta-economic processes but rather embedded in land and institutions, and their particular histories13. What seems central, as we will see in this essay, is that the very same elements that disrupt the planning Grid are central to the opening up of an economy – usually of small firms. As for the institutional aspects of gentrification, we are led to consider the particular genealogies of the formation of urban property. This also implies that configurations of land and economy, while disrupting / subverting corporate capitalism, have not just evolved as a ‘counter’ force but rather, as per Eyal Weizman’s argument on the conception of cities, operate on a completely different plane14. Thus, the opaqueness of particular forms of urbanism is a central condition that subverts neo-liberalism beyond co-option or discipline. Walter Benjamin’s voice emerges once again, along with that of Asic Lacis, in their essay on Naples15 which points towards more interesting spaces, via their use of ‘porosity’. 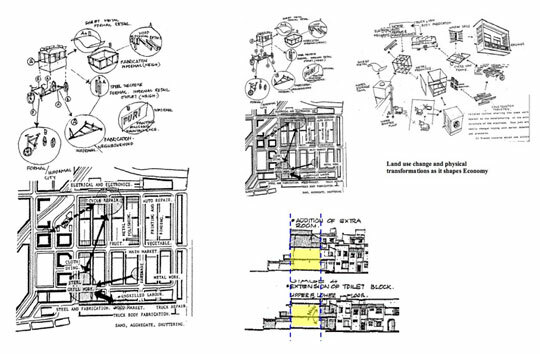 ’Porosity’, here disrupts the boundary of the Grid, and allows the city to appropriate the street. 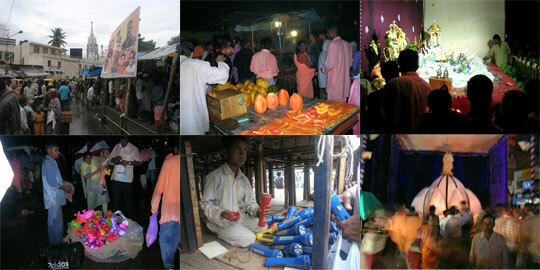 These images show a temporary road side structure set up at Christmas time in the Juhu area of Mumbai. This is part of a wider set of popular interventions of shop fronts, terrace level modifications in the building behind. All of these are not ‘informal’ but rather have a genealogy of political (often stealth like) negotiations with local government on the regulation around the use of space that make public and private porous and temporally fluid. Are we, in the three points above, describing elements of Neil Smith’s argument of the ‘revanchist city’16? And in doing so, is there a more complicated and necessarily uneven force at work in the way city processes develop a counter-drive? For instance, Sundaram highlights complexity and opaque urbanism, which incorporates fear and the potential that lies in conflict-ridden planes, and is driven by speed of change and fluidity17. But is this also a force that erodes and subverts the high art of culture, of modernist zeal, of neo-liberal legitimizing activism? In this radical perspective is urbanism a force that dissolves boundaries, shaped by the porosity of the undisciplined city where ‘the street’ disappears and the politics takes over? ‘Double storied quarters’ Bhogal, Dehli. These mass-produced two-room tenements were built by the Refugee Rehabilitation board in 1953. But over time, underwent significant transformation. 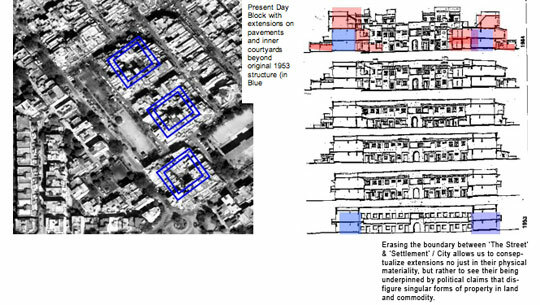 The transformation of Bhogal’s ‘Double storied quarters’ refugee housing blocks. They now are vibrant areas with all the complexity of city life – its economy and politics. The blocks are both porous, and – in the eyes of the city planner and the high-level bureaucrat – opaque and ‘un-organized’. Our account of such ‘porosity and opaqueness’ is central to understanding this progressive radical transformation. The ‘transformative’ aspect, emphasizing radical politics, is associated with its porosity: look closely at the blue lines and you can see the substantial buildup via the intensive community control of space, but also the economy, in the huge number of small and medium sized shops, small workshops, local daycare and primary schools, medical practitioners and walk-in health clinics, and, just as important, a weekly market that sets up stalls along the main streets. These images reveal an urbanism with significant anarchic aspects. The intensive physical changes come about via intensive local negotiations and political resolution using municipal councillors to influence various levels of government – initially via the refugee rehabilitation board and the relevant Minister, and later, via the municipal council. Planners like to see these changes as “informal, or acts of desperation”. This urbanism is a mainstream political process deeply implicated in self-organizing urbanisms. 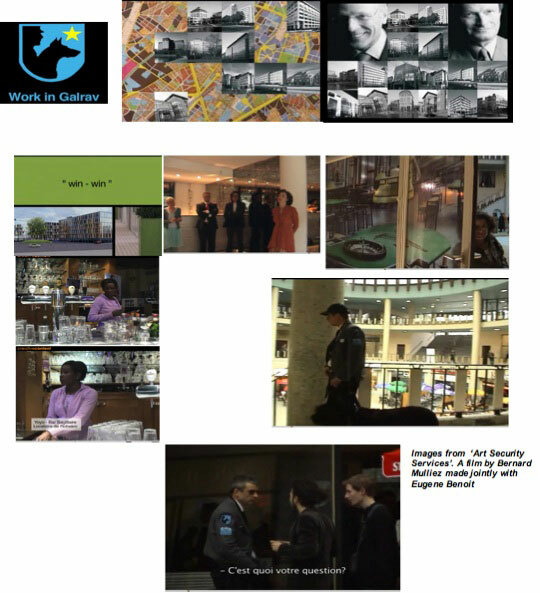 ✪ Fluidity of identity where varied ethnic groups with varied historicities inter-connect with those of the land, economy, and municipal politics. The power of such urbanism lies in an autonomous political consciousness that is not dependent on social movements (although it shapes such events in substantive ways). Such consciousness is deeply implicated in common day to day acts of city building and gives rise to municipal politics to use land for housing and the locally-based economy, and to resist and subvert Master Planning, as well as mega projects now promoted by international financial institutions and large real estate developers, under neo-liberal globalization. Thus, Occupancy Urbanism disrupts several current narratives that de-politicize, or renew colonialism: ‘the planned city’, ‘third world developmentalism’, or competitive cities built around the ‘creative class’. As a concept it is beyond assumptions of Marginality, and it operates via acts of occupation – of land, economy, political processes and institutions, and identity. Its political substance lies in disrupting the assumed ‘smooth’ flow of Capital within the commodity process. Not just that, but with the encroachment on ‘ownership’ and ‘property’ it posits a radicalized view of ‘commodity’ and democracy18. Such a view of power and politics is not new, and references to Foucault are central. The issue here is not just fluidity, but its implications in urbanity, of complex, uncertain and often dialectical excitement, and of day-to-day consumerist rituals. What is evident in the Bhogal Blocks is not just the physical changes, but also the huge economy that makes hard boundaries between the ‘street’ and ‘living quarters’ irrelevant. 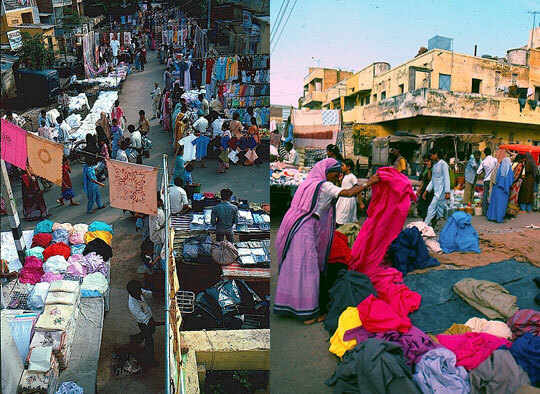 Market at Bhogal Blocks, Dehli. This is particularly true every Tuesday afternoon, when most of the street front hosts a weekly market that involves both local residents and traveling vendors. All this sends a chill of fear into the mind of the obsessive planner – with the drive for order within the Grid, to frame the Rule of Law, and to identify the ‘encroacher’. The obsession with planning to control and subvert the human spirit runs counter to the essence of cities and their dynamic transformation. Usually, this transformation is negatively presented as ‘demographic growth’19 that manifests itself in ‘unplanned slums’, and ‘informal’ economies that together fuel a regressive politics, a specter of fear and doomsday. Not surprisingly, in times when cities are forced to be ‘globally competitive’ or perish, such fears are used to justify dirigisme: on one hand a neo-liberal regulation aimed at promoting a homogenized ‘free’ (and global) market, while on the other, a repressive Nation State that uses state powers (in the name of public interest) to reinforce the power of corporate might. The current obsession with ‘policy’ is also not surprising. Critical analysis shows the connection between ‘policy’ and ‘police’ illustrated in fractured North American and European cities characterized by fear and raciality, giving rise to the need to control and manage ‘growth’ . ✪ Are we witnessing an opening of political space to a substantive urbanism that appears transformative in political consciousness? ✪ Is this transformative process beyond a specific ideology and rooted in day-to-day practices of occupying land, economy, and particular political institutions? ✪ In the cities of Northern Europe and America are we now witnessing the recent emergence of such spaces, spaces that emerged much earlier in cities of the Global South? ✪ Given the shape of city growth in the Global South over the next two decades, and the likely spurt of both migration and the consolidation of refugee districts, do cities in the Global North also face radical transformation? ✪ How useful are the commonplace narratives of cities in both the North and South that view the issue as policies regarding ‘Competitive cities’, developmentalism, or, inclusive growth? In an earlier work, I had proposed the concept of ‘Occupancy Urbanism’ as a conceptual lens to understand contestations over space and property. There is a possibility that such urbanisms are interpreted as a heroic ‘tactics’ to counter hegemonic ‘strategy’ (as posited by Michael De Certeau in his influential book Cities of Everyday Life. 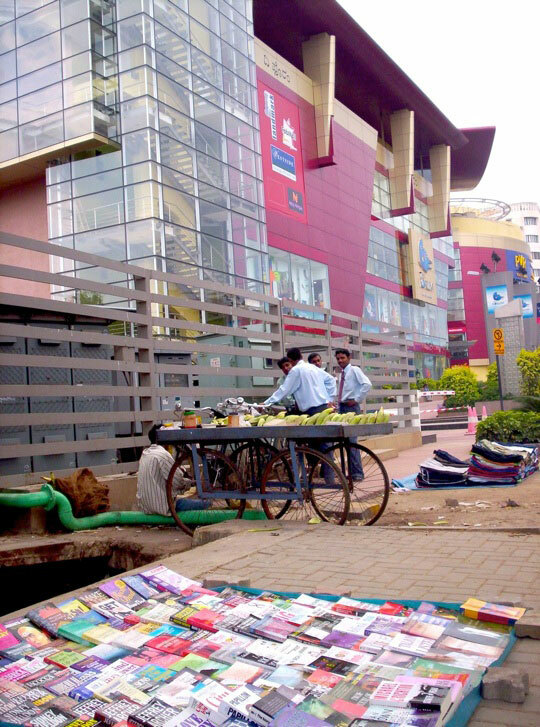 Put simply, when hawkers move to occupy part of a pavement, or locate under an expressway, the ‘more established’ shops that line the street remain unmoved. And such a view is possibly accurate – perhaps when seen in the context of cities in North Europe and America. But even so, this may only be part of it. There are two problems in the assumption of ‘marginality’. The first is a conceptual one. Viewing these city terrains and economy and political spaces within a binary framework (Tactics- Strategy; Informal-Formal; Developed-Under-developed) removes politics, and sets such processes on a developmental trajectory. The second is empirical. Think of not just the distant future but also the present. While statistics have yet to catch up with this inconvenient truth, the bulk of city growth is in the ‘global south’, and such locations overpower the ‘planned’ city in terms of economy and the occupancy of space; they re-constitute city locations and culture, and underpin political consciousness. The ‘northern’ city may not be very different: as immigrant shaped neighbourhood districts, and several of these exhibits show, streetscapes rapidly resemble their multiple histories but also global connections via economy and culture. Such Occupancy urbanism is much more substantive and rejects conceptual binaries or developmentalism. Instead, such urbanism is about events and processes that merge economy and politics. But, rather than the old political economy that assumes linearity of development shaped by technological progress (transforming political consciousness), what is valued here is the fluidity and uncertainty of space that binds economy and politics in an immediate materiality, and the substance of such urbanism is in being ‘occupantist’. This refers not only to the scale (the vast area of city terrain), but also the radicalization of property: in land, in the media, in economy. Most significantly, as noted by Jeebesh Bagchi, such radicalization happens “within the commodity process”. This last point is important in understanding the ‘Transformative’ as being substantive and not the tactics of a dis-empowered marginality. Such a perspective points to an oppositional concept, to borrow from DeLeuze and Guattari (1987) of a ‘Nomadic’ city that appropriates the streets and disrupts the Grid. If so, than our traverses through central Delhi’s Bhogal, and its economy, reinforce the irrelevance of the language and frames of developmentalism and planning, including its oppositional ‘alternatives’. Rejecting this narrow discourse, allows us to enter an expansive urban terrain trance-like realm unbound by dogma. 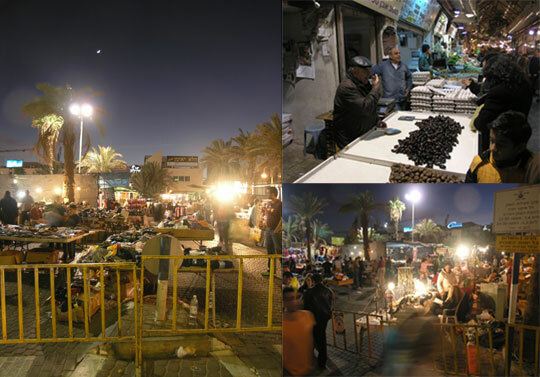 Let us instead, in a spirit of intellectual travel, visit to the main souk in Eilat, Israel. 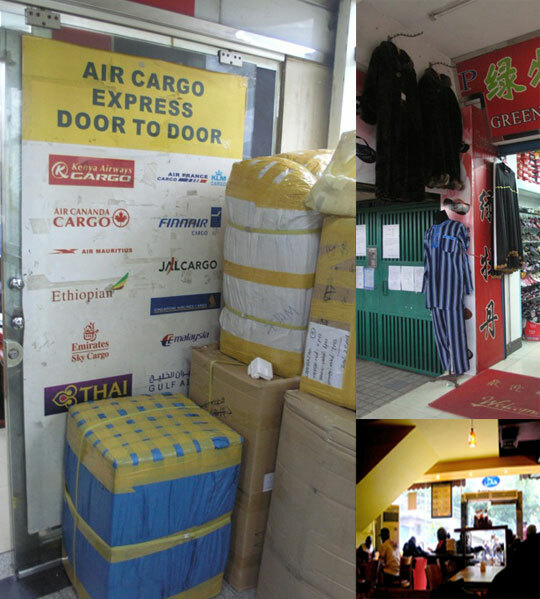 Here we look at the multi-city/town traveling market that competes with that country’s malls. The event, held on Tuesdays and Thursdays, dramatizes spatiality into an outdoor Mediterranean bazaar. We can see that the municipal council’s notice board at the entrance enforces parking regulations and rates for this public parking square now turned shopping arena. Fees in lieu of parking open up claims made by the association via municipal politics – only one of the many moves to occupy space. Similarly, such occupancy of territory is witnessed in the tiny town of Karkur. Here, a townsperson after noticing initial occupancy on ‘left over’ spaces, negotiated with Eged, the country’s main bus company. 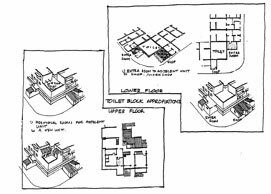 The company, like others in a previous era of grand master planning, had been over-allocated space that remained relatively unused. The arrangement here involved the townsperson leasing the entire space but then sub-leasing these to the traveling market’s individual traders whose requirements for smaller spaces were shaped by differential rates for location and the complexity of spatial economy. Economy here is not about free market ‘entrepreneurialism’ as these types of cases are often used to justify. In fact, there is hardly any ‘free market’ at all. Not surprisingly, the Karkur souk ended after neighboring shopkeepers in the planned, ‘allocated’ shops, mounted a campaign centered around a typical planning issue: congestion! It would hardly be surprising if it turns out that the planning campaign too had its bureaucratic ‘ins and outs’– just like the process to establish the souk in the first place. Thus, the ‘political consolidation’ here is not just a physical act but one that is political, mainstreamed into bureaucracy, and specifically where administrative procedures reflect cultural associations with a space of trade, excitement, and urban life. The accompanying photos show Bangalore’s St Mary’s festival – a month-long celebration around St. Mary’s Basilica located in Shivaji Nagar – a central area in the city. In this month, huge crowds take over the space, set up stalls, and sell patently look-alike brand products and juicy tropical fruits. Local Muslim financiers help to sponsor this event, which is a Catholic one, but where the Infant Jesus and Mother Mary are driven around in a Hindu inspired chariot on the last day. This is indeed an event that mixes various different kinds of people seeking blessings – for day to day material and immaterial questions: those who are sick, those looking for success at job interviews, exams, help in business downturns, and those just wanting to be part of this exuberant display of human spirit. So much so, that one major attraction is a model of the Bhai Temple of Delhi that symbolizes such a congruence of faiths. These are not the property-stratifying landscapes of post urban renewal East Manchester (Mc Neill: 191,195) or Brussels’s central pedestrian zones, that witness the violence of art’s aura reinforced by exclusive urban design and designer arcades (Mulliez Nd in Eugene 2008:10;). Instead what we witness is the disruption of singular property to subvert exclusive heritage conservation – attempted with great designer zeal via corporate business in Mumbai and Bangalore and Delhi’s state power. My point here is not just the urban ritual, but to underline how, from a planner’s point of view, this act would be highly illegal; it is also illicit in the eyes of those promoting Malls, given the extensive sale of branded products. Months like this, so common in the Global South, defy all control by centralized capital, and this intensive anarchic consumerism defeats Capital via its very erosion. Another wonderful illustration of subversion within the commodity process! Reading city terrains reveals how mega infrastructures and corporate might are threatened. Yet the threat comes not from visionaries leading social movements. Rather, with a superficial similarity to de Certeau, and beyond, it happens by means of ordinary day-to-day acts by ordinary people. These groups, as Diane Singerman notes in Cairo, act in ways that are highly political even though they may be invisible to the political act. Secondly, it occurs both stealthily and in common place institutions: the municipal council. Thirdly, such transformative politics is highly material and underpins urbanism. It is centered on land, seeking infrastructure and services not just for housing, but also small factories and manufacturing units, and the commerce that often takes place on lower floors of these in a vast terrain characterised by mixed land-use21. But with this comes a realization of extensive breaching of IPR, rampant piracy, and zoning violations22! The materialism of land and economy (a livelihood that is immediate) is highly politicizing. Even children know the politicians, and meet them on weekly, and sometimes daily visits, and know of the lower and middle level bureaucrats who figure out official procedures to ensure technical loopholes to subvert evictions, and de-facto land tenure. The magic of bureaucracy: Occupancy Urbanism is magical. 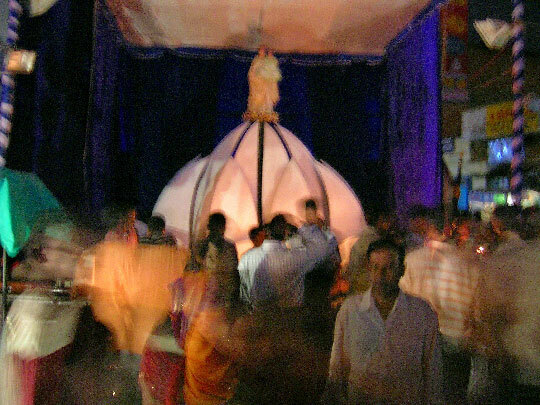 Of course the magic of St. Mary’s feast in tropical Bangalore’s warm, wet August evenings is highly alluring – especially when inebriated by the swirling masses and their celebratory spirit. But here, I point to another kind of magic, which is normally seen to be quite the opposite. Master Planning is the darling of corporate business – which sees it as a way to replace unplanned development that subverts competitive globalization. It is also attractive to the classical leftist and many progressive activists who assume that the central concept underpinning the plan is that of ensuring ‘social justice’. Master Planning is rendered ineffective by the very regulation that forms its raison d’etre. Here, we introduce the magic of the lower and middle level bureaucrats and small time politicians, and the centre of this grand subversion, the municipal council. The images above show a parking lot of New Delhi’s main Income Tax Offices which also house, apart from Lambretta inspired scooters and motorbikes, a range of retired bureaucrats and agents, “notary” publics, street level lawyers who are all well versed in creating and maintaining a ‘porous’ legality catering to popular society’s appropriation and radicalization of urban territory. Rather than dispose off such fallacies of social justice, the bureaucratic apparatus is pushed into forming new administrative procedures, expanding loopholes to allow the inter-mixing of land use to allow for home-based commerce, manufacturing, and the extension of infrastructure and services into ‘illegal’ areas – in effect strengthening their ‘de-facto’ tenure. The diagram on pg. 555 in the Sarai essay describes this effect and makes a fundamental point: this re-appropriation of mainstream political and administrative institutions takes place in a cross causality of land being claimed and its transformation as an economic setting, both of which lie within the commodity process. Thus, the issue is not the creation of an ‘alternative’ that competes with an all encompassing ‘mainstream’, but rather, when the Mainstream, now so supportive of big business, finds itself eroded, yet again, within its own commodity logic – in economy, in the occupantist settlement of land along diverse tenure regimes, and central here, the magic of the bureaucracy that re-constitutes its administrative politics23. There is no greater fear for the centralized planner and global capital than that of the lower level, murky, stealth-like bureaucracy and local politics that bogs down their assumptions of smooth flows. One interesting question is whether this political consciousness is a false construct of capitalism and one that actually enslaves? Here I turn to the immigrant communities in Toronto, the suburbs of which list more than 50% of the population as visible minorities or first and second-generation immigrants. Listening to Canadian Multi-cultural radio (CMR 101.3 FM) gives us the impression that the new immigrant communities in Toronto’s large ethnically characterized suburbs are captivated by the great Americanisms: car, two garage house with den and hardwood flooring. Is this the way Capital recoups its surpluses, from a newly arrived migrant workforce, as well as inculcating conservatism? At a closer look this consumerism is shown to be layered with other complex materialities that diffuse centralized control. Advice on the subtleties of immigration, stringent political commentary on George Bush’s US splitting the Shinas and Sunnis, several pot shots at Canadians’ efforts to integrate diverse ethnicities and comments on the famous criterion of ‘Canadian experience required’, along with the grounded realities of ‘reasonable adjustment’ that contests its official ‘multi-culturalism policy’. Other hints point to one of the central politics of immigration: the need for an international labor force to work the country’s land, its highly polluted oil sands economy and tough agricultural systems, and to fund the future health care of an aging white Canadian population. Inter-spaced in this critique from ethnic groups are efforts to access the Nation state and root it in a daily life of children’s college education funds, ways to learn Canadian accented English, disability insurance for truck and taxi drivers. 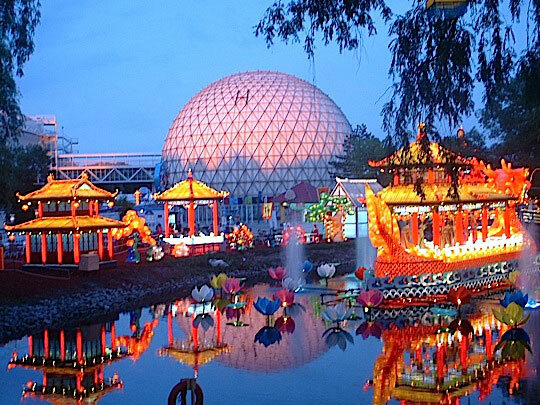 But the real erosion of capital in Toronto takes place via its reconstitution of the haunts of consumerism: the reconstituted Malls and the city’s China Town and other immigrant haunts! The largest ever Pacific Mall catering to East Asian groups, the biggest ever planned South Asian Mall, The Sitara, and smaller older shopping centres: China Town versions of Dragon City, and China town centre24. Set in the cold of Canadian winters, these interior spaces parallel the bazaar venues of warmer climates. Inside, rather than brand names, are discount floors full of ‘seconds’ garments, pirate CDs, look-alike labels, and cheaper, non-brand names. 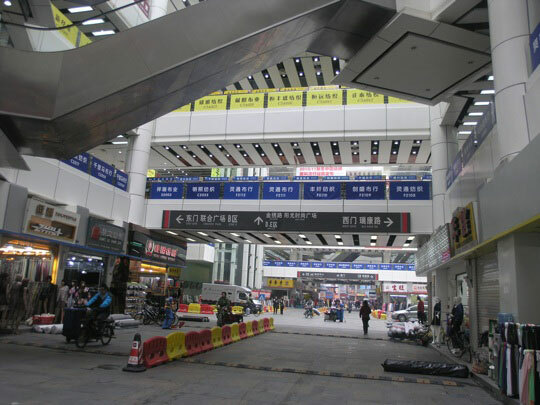 Other malls and smaller shopping centers house a variety of daily consumption goods. These, then, represent almost an antithesis of the Mall as a centre for branded enterprise! 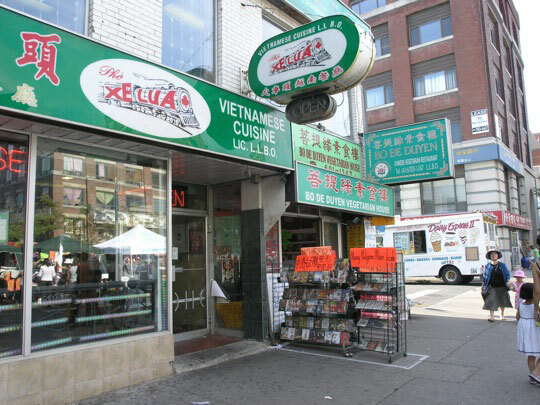 Such radical territory extends to the streetscapes – seen most explicitly in Toronto’s China town. Here the occupation of pavements pushed via the city council into designated hawking spaces continually challenges the limits of these negotiations. 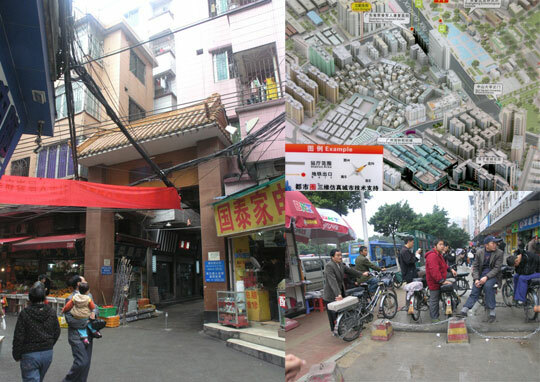 Image showing designated extension zones along China Town’s pavements. The accompanying images show not just the hawking but also the white line on the pavement demarcating the territory negotiated with the city council via the trade associations. This particular case is a spatial parody, when a designated space is used to sell pirate DVDs! In other locations, very poor, elderly Chinese and Vietnamese women attempt to claim even more of the pavement, defying the council inspectors whose rounds attempt to move trade into their designated, negotiated zones. 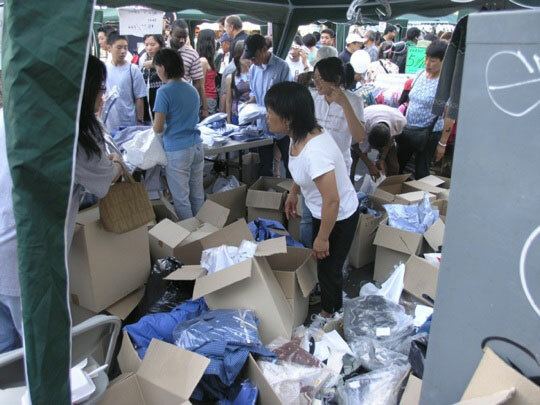 Selling their wares at a dollar a mound, they are expertly abusive in Mandarin when confronted with this illegality! Sales at China Town Toronto. This assertive spirit gets particularly energetic in the annual China Town festival, when an entire street is cordoned off for the two-day event. On display there are not only ‘dress’ shirts for a seventh of their price – a blatant illegality challenging piracy laws, but also the booths of the main politicians – a reminder of such intensive political acts. What we see here is the consumerism that represents non-corporatized flows (occupying the space of branded goods) effecting a major subversion within capital itself. Such retail economies now assume trans-national connections. 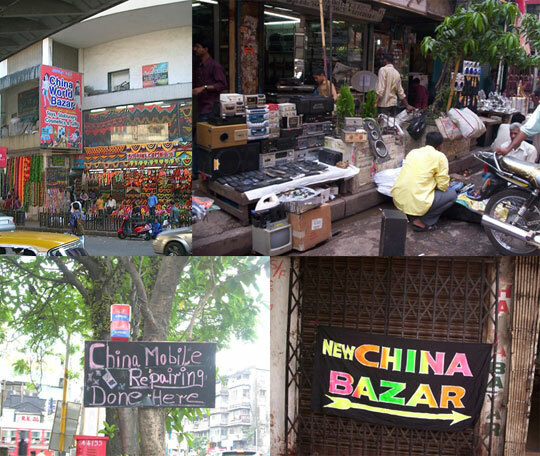 Most Indian metro cities, and smaller towns too, have ‘China Bazaars’. How do we relate to such street level transformations when we also confront a media and academic discourse (across ideological positions) that locate an urban narrative to be vantaged to a meta level, reducing the city to a ‘contingency’? For instance, the common narrative of Chinese urbanism is located in films like Manufacturing Landscapes and accounts in several issues of the New York Times in 2008-09. These emphasize the regressive urban change promoted by land developers being ‘hand in glove’ with local administration and driven by speculative real estate exploitation. This narrative, of a meta-modernity subjugating ‘tradition’26, reduces the complexity of city politics to one of a high-aesthetics: The revealed value of the ‘Hotou’ residential districts of courtyard houses especially in modernizing Beijing. Here, just as some heroic individuals decide to take on large land developers and an authoritarian state, we are told of the ‘heroic’ efforts of (usually western educated) individuals who “value” these environments and with their access to capital, work to preserve “heritage structures and zones”27 They bring with them, liberal notions of democracy (and its generative capital) that “authoritarian” rules seem to find no place for. Both these aspects converge in a common narrative, which assumes as a given reality or as an immediate inevitability, ‘the Grid’ to form the basis for Global Capitalism. In effect, what is being erased, even in the critical perspectives, is the replacement of political space with a replacement of a unilateral economic one. My point here is not to dismiss the harsh eviction and demolitions that the NYT and other media point to. These are important and harsh realities. Instead, my argument is if there is a need to complicate how we conceptualize the complexity of city contests, and pose the question if such types of narratives from the NYT, in effect, and across ideological lines, accept the ‘High modernism’ as exemplified by Shenzhen as inevitable? Does the image as shown in a landscape of factories reinforced by monotonous and de-humanizing blocks of worker housing form a metaphor for loss, and one that erases the possibility of cities being viewed as more complex political and economic territories? Should we not look more closely at histories and political genealogies, unbound by what Tang and Roy28 pose as ‘western lenses’, and emphasize what Robinson29 points to the everyday life of ‘Ordinary Cities’ and the spaces they open up? In doing so, perhaps we need to accept narratives that are necessarily confusing incomplete, fluid and chaotic. These are not unlike what Simone points to when looking at African urbanism30. This view, not easily acceptable by policy makers and academics across ideological positions who lay their rational in ‘the grid’. The city in their view is a terrain of fear whose complex uncertain dynamic is “psychedelic”, where political terrain lies un-disciplined by programs and policy. In the Indian case, the last issue is particularly highly threatening to activists-academics. While they are rightly at the forefront of condemning evictions as witnessed in Delhi, and Mumbai, their power and legitimacy lies in re-creating a progressive panoptic vision to make the logic of the city transparent, surveyed and enumerated31. Not surprisingly, as one radical activist mentioned while discussing India’s biggest ever surveillance program, the Unique ID no, they become apologists of such governmentalities32 laying their hope in the Nation State to materialize their panoptic dreams. Such rationalities are immersed in, what one academic usefully termed as, ‘salvation army type developmentalism’33 – which the city on the ground disrupts and unsettles. Is Occupancy Urbanism inherently ‘Nomadic’? To recover a political narrative, we start a re-think with one of the most important signifiers of such ‘narratives of loss’: Hong Kong’s Kowloon Walled city34. When viewed as a narrative of ‘place’ we are presented with a narrative of the loss of an anarchic space, and one rich in economic and political possibility – subsumed both by globalized capital, modernity, and the Nation State. I looked at some of these issues in the Indian case, but a recent visit to Guangzhou and Douggaun in mainland China suggests a wider and more complicated geography to consider. It is important to clarify, like in the Indian case, the idea is not to dismiss harsh evictions and regressive urban renewal in Beijing and elsewhere in China, or to dismiss the connection between local governments, land markets, and large property developers. Rather, my intent is to suggest a political realm of complex possibilities that include evictions and in other cases subversion. Some of this includes, a position similar to critical theorist, an examination of the role of large institutions like the World Bank and IMF that through their loan conditionalities lay the ground for harsh urban renewal35. But it also includes a consideration, without necessarily an agreement over their perspective, of the works of Hsing who with others point to a complicated dynamic of local government engagement with land issues, and the way economy gets entangled in this administrative politics36. 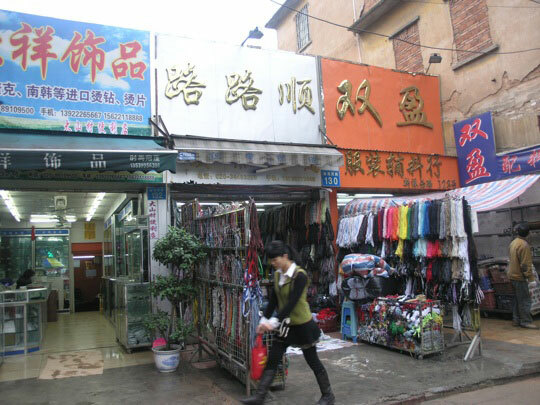 The metropolitan area and the core city of Guangzhou have several urban villages that house particular types of economies: Garments, electronics, and hardware. And it is not just the main garment center that is important, but also the ancillary units. Here we witness even further confusion of the easy narrative that treats ‘property’ as an inevitable finality whose control lies in a higher plane – the binary of a global and homogenized market, or then a realm regulated by the Nation State. We could also trace, and these are necessarily only traces due to their stealth like complex institutional politics, the political logic that plays out. This again, is not set within a binary of the global homogenous market regulated by international conventions shaped by corporate power, or then higher levels of government as the Nation State. Instead, this politics is embedded into the occupancy of terrain and of commodity circuits – where local party officials are embedded in their most material realm. With this, it becomes useful not to see the urbanism of Kowloon’s walled city as a historic event but rather to move across to Guangzhou, and as we shall see below, even more so, in the thirty-one village towns that now constitute the manufacturing district of Doug Guan. Such ‘urban villages’ are where porosity at the best, and a form whose politics keeps urbanism ‘smooth and nomadic’. Guangzhou is reputed for instance, with it’s autonomous politics and distance from Beijing, to have been more relaxed and progressive about ‘Hokou’ or residency permits. After all, if these ‘occupiers’ of space form an economy, which implicates the economic and political clout of local government, this would be hardly surprising. 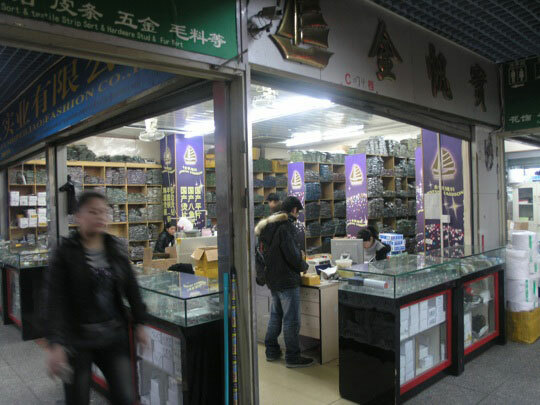 Locals mention how the trading center of Yiwu, discussed earlier in this essay, formed due to the space shortage of this city. 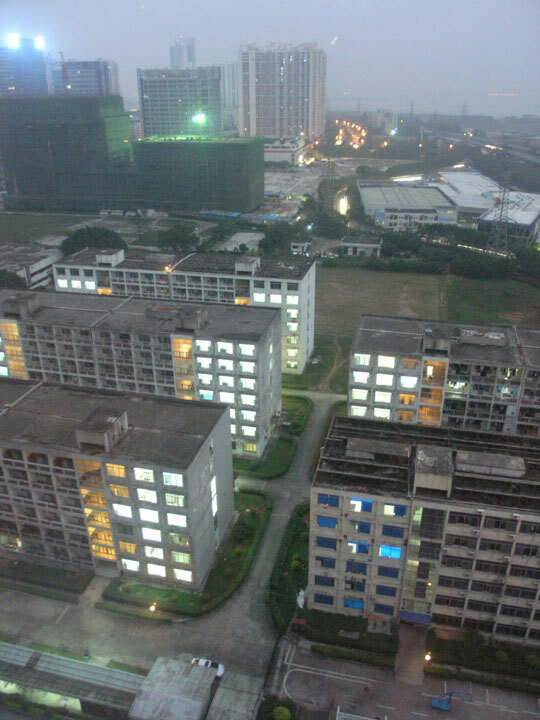 But if Guangzhou inter-spaces its terrain with urban villages, Doug Guan is a vast conglomeration of urban villages. Here too, and in a far more reinforced way, is the building up as mentioned by a senior planner in the Guangzhou administration, a ‘ground-up’ highly dynamic economic territory. 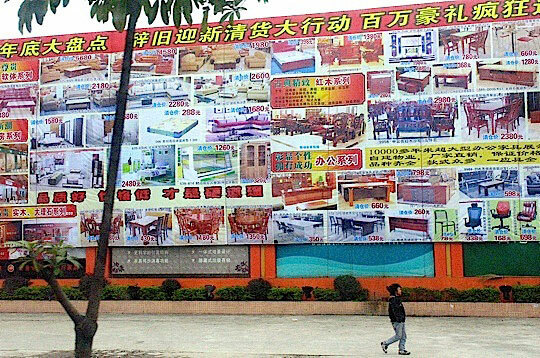 The advertisement outside one of the main furniture ‘clusters’ in Doug Guan is a sharp contrast to the more official ‘grid’ of urban designed and starkly barren Science City37. trans-global flows into other parts of the world? Mainstream Politics is necessarily “Psychedelic”! Such a perspective on the disfigurement of the possibility of ‘The Market’ would be deeply unsettling to lawyers from NYC whose corporate clients seek surpluses in China and India. It would be deeply threatening to the US Senate or at least induced into being so. An indication of the extent of how threatening such “psychedelic” spaces is reflected in the lobbying by large North American (and European) corporations at the US Senate. The move here is to suggest not just these groups, but rather entire forms of urbanism being criminal39! Of course these efforts are driven by competition over economic and political space, locking branded retail capital within exclusive Malls. My point here is the political terrain we explore in this essay is mainstream and underpins the various layers of such ‘occupation’: of space, of economy, and the complex leasehold-based tenure systems. 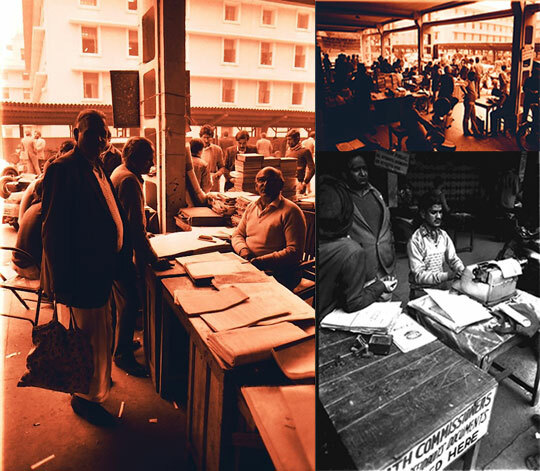 The last aspect underpins not just spatiality and economy, but also reflects materiality in administrative procedures via ‘the magic of bureaucracy’. 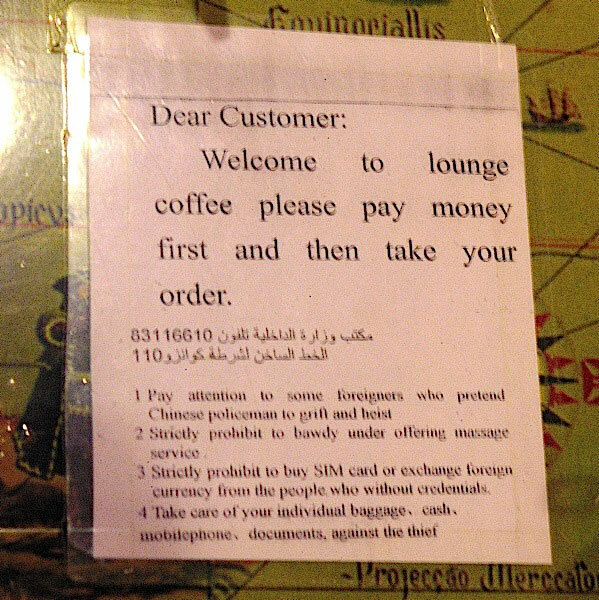 a notice pasted on the table of a restaurant frequented by West African and Middle Eastern traders in central Guangzhou. If we use as a metaphor the famous film on Honk Kong Chung King Express, than the by lanes of Guangzhou, Dounggaun, Yiwu, evolve into a mix of Mandarin, Cantonese, Vietnamese, Punjabi, Urdu, Bengali, and several others, but also perhaps a form that is impenetrable to anyone seeking clarity and predictability as a first step towards centralized control by the Nation State, Globalized capital, their lawyers, bankers, and planners. Politics here, not surprisingly via the Porous Bureaucracy, would remain of stealth and secret glances! Since then, it has greatly benefited and influenced by conversations with Jeebesh Bagchi, Sveta Sarda, Rohan DeSouza, Prasad Shetty and Rupali Gupte. 4I refer to Deleuze and Guattari’s ‘A Thousand Plateaus: Capitalism and Schizophrenia’ (Translated by Brian Massumi) University of Minnesota Press (December 1987) but also relying in great part, on an excellent essay by Christian Hubert accessible at christianhubert.com/smooth_striated. It will be evident that unlike Hubert, I suggest that a ‘Occupancy Urbanism’ has a “Nomadic” aspects that disrupts striations of corporate capitalism. 6For and account of these in Bombay and Bangalore, see: a) Koppikar S., Razing Crawford: Goods once sold. A BMC plan, a Bombay heritage. Will Crawford Market go down easy? 13I am grateful for these insights to a variety of people: To John and Debbe O Rourke for taking me on a walk of the Queen street area as a way to visualize the transformation in these areas, and a sense of the complexity of institutional politics. Also, as part of a community connected to the arts, but also as workforce in Toronto’s fashion industry they and others at the ALPHA Alternative School have insights that somehow seem to get rarified in more professional realms. One exception to this however, is Prof. Richard Stren at the University of Toronto’s Department of Political Science, whose detailed reflections of Toronto’s institutional history pre and post the 1998 amalgamation remain some of the sharpest analysis that influenced my own thinking on what such efforts have meant here in Bangalore. 16Smith, Neil. 1996. The New Urban Frontier: Gentrification and the Revanchist City. London ; New York: Routledge. 21This economy is hardly ‘marginal’. Recent studies from India’s most conservative economic institute, the NCAER in Delhi, aim to set a potential market share for global capital accessed points out that the ‘unorganized sector’ relates to 67% of economic value addition, and 95% of city employment. All this happens in 85% of city terrain rather than the 10% that is master planned. 23See Fig. 12 (pg. 561) in an essay for the Sarai reader, which provides more evidence of these circuits. Benjamin Solomon: “Touts, Pirates and Ghosts” in Sarai reader 05 ‘Bare Acts’ Feb 2005 www.sarai.net/publications/readers/05-bare-acts/01_solly.pdf. 31This argument came out of discussions with Jeebesh Bagchi, Svehta Sarad, and Prasad Shetty in considering the evictions in Delhi, Mumbai, and the new GIS based surveillance technologies, including India’s recent Unique ID no based on biometrics. 32This emerged in a discussion following a lecture by Dr. Usha Ramanthan on the UID in Bangalore, December 2009. 33This term was mentioned by Katherine Rankin in the context of how a critique of NGOs becomes very emotional among some student groups.